A pterygium is a wedge-shaped growth of fibrous tissue, containing blood vessels, that extends from the loose tissue covering the white part of the eye (the conjunctiva) and grows onto the surface of the cornea (the window of the eye). It typically starts growing near the inside corner of the eye next to the nose, but it can also occur on the opposite side. It usually grows very slowly and may stop growing completely. In some cases it can grow completely over the pupil, causing astigmatism, corneal scarring and blindness. A related condition is a PINGUECULA which is similar to a pterygium. It is a soft yellow mass confined to the white part of the eye. It can be surgically removed in the same way as a pterygium if necessary. There is good evidence that it is one of a spectrum of disorders that are the result of exposure to UV light – but there is almost certainly a lot of individual variation in susceptibility. Chronic irritation from wind and dust, or an arid climate are also believed to predispose to development of pterygium or pinguecula. They are more frequently observed with increasing age. 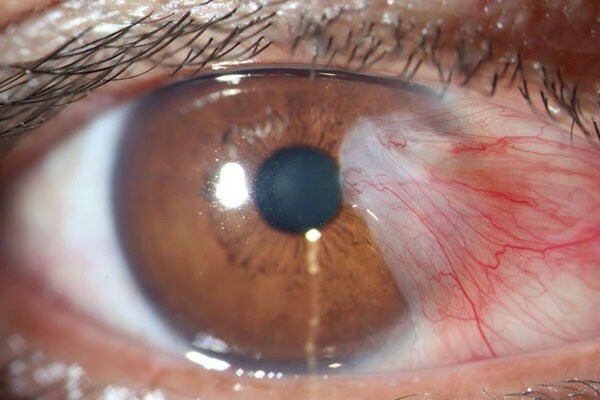 What symptoms does pterygium cause? Pterygium causes a red watery dry eye in the area of the elevated lesion, which dries out more quickly due to the fibrous tissue lump being elevated on the surface of the cornea. In more advanced cases, pterygium can grow over the cornea, compromising vision, interfering with contact lens wear and leaving a permanent corneal scar. Pterygium needs to be treated only when it is causing discomfort or is affecting vision (due to causing corneal astigmatism or growth over the centre of the vision), or is interfering with contact lens wear. A pterygium often leaves a permanent corneal scar, which may affect vision. It may also be advisable to remove a pterygium if it is adversely affecting intraocular lens measurements for cataract surgery. If the pterygium is small and causing no or minor symptoms, it can be left alone and treated with artificial tears lubricants. It should be reviewed if it appears to be getting larger. Some people dislike the appearance and request to have the pterygium removed for this reason. Mild discomfort is due to a drying effect on the surface of the elevated pterygium, and can be relieved by lubricants. More extreme drying causes inflammation, and a short course of steroid drops can be helpful when this occurs. More severe symptoms, that do not respond to these simple measures, can be treated by surgery. The most frequent method of surgical treatment is excision of the pterygium combined with a conjunctival autograft (using tissue obtained from the white of the eyeball underneath the upper lid). This is associated with the least complications and a low recurrence rate . The autograft can be sutured with fine dissolving sutures, or can be glued using a biological glue. The procedure is performed as an outpatient procedure with the use of anaesthetic eye drops and a small anaesthetic injection around the eye. A gentle eyelid clip is placed to keep the eye open for the procedure. A clean plastic drape which sticks around the eye will be used to keep the surgical field clean. There will be oxygen and air coming through underneath the drape. You can breathe and talk freely, and let us know if you are uncomfortable. If you are very nervous, the anaesthetist will give you medicine to keep you calm and relaxed. The procedure takes approximately 45 minutes. The pterygium is removed from the cornea. The cornea underneath the pterygium is made as smooth as possible. Sometimes the pterygium has caused permanent scarring of the cornea. Usually this does not affect vision as it is so far away from the centre of the vision, but if it is extensive scarring, it may affect vision. All scar tissue is removed, at the edges of the opening left behind after the pterygium is excised. Then a small graft of conjunctiva is obtained from the upper part of the eyeball, exactly the same size as the defect, and sewn in place with a fine dissolving suture. The suture does not cause much discomfort and dissolves, usually after approximately 4 weeks. Sometimes Miss Saw uses a biological glue derived from donor blood product to secure the graft to the eye. When glue is used, a bandage contact lens will be placed in the eye at the end of the procedure. This contact lens will be removed 3-7 days after the procedure. You will be given eye drops to use for at least 8 weeks after the procedure. These can be started the morning after the surgery. The eye will be gritty, sore, red, and sensitive to light for at least one week afterwards. The eyelids might also be quite swollen. Cool compresses (ice wrapped in a face towel, or cooling eyepacks obtainable from the pharmacy) help the eyelid swelling and pain during the first few days. Pain is usually worst on day 3, with gradual improvement thereafter until day 7. The vision may be blurry initially as the surface cells on the cornea heal over. Taking regular paracetamol or Co-codamol, 2 tablets every 4 hours (maximum 8 per day) with regular oral non-steroidal tablets such as Nurofen or Voltarol 3 times per day (providing you do not get gastric upset from these) will help during the first 3 days. The eye will be red for approximately 6 weeks, but gradually getting less red each day. Pterygium surgery is successful in 95-98% of cases when a conjunctival autograft is used. Recurrence of the pterygium. This occurs in 2 – 5% of cases with a conjunctival autograft (compared to cases where no autograft is used, which have 30-80% recurrence rates). Decreased vision due to corneal astigmatism and scarring. You will need to take at least 1 week off work following the procedure. You will be putting eye drops in every 2 hours initially during the week after the procedure, then after this 4x per day, with artificial tears as necessary. Using the eye soon after surgery will not damage the eye, but it helps to rest the eyes by keeping them closed, as this encourages them to heal. Dusty environments are unlikely to damage the eye, but may be irritating, and should be avoided for 1 week after surgery. If you get dust, dirt or an eyelash in your eye, wash out with an eye drop. Wear sunglasses for comfort and protection from UV light when outdoors. Put an artificial tear drop in if the eye feels itchy or irritated. Why choose Valerie Saw for your pterygium surgery? Valerie Saw has extensive experience in managing pterygium and is a skilled expert corneal surgeon. 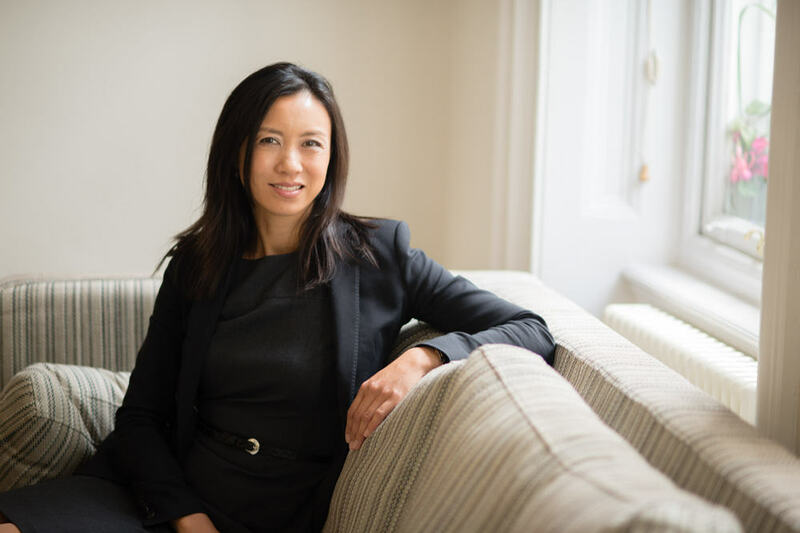 As a Member of the Council of the British Society of Refractive Surgeons, and an invited Examiner for the Royal College of Ophthalmologists’ Certificate for Laser Refractive Surgery in the UK, she is recognized by her peers for her expertise in cornea, lens and laser eye surgery. She has been voted amongst the top 10 Laser Eye Surgeons in the UK by patients, for her outstanding surgical skills.